APS provides comprehensive Upset Prevention and Recovery Training (UPRT) solutions using a dynamic combination of base programs and enhancements to directly address the Loss of Control In-flight (LOC-I) threat. To find a base program and optional enhancement that meets your training requirements, select your preferred training location and training medium below. You can also click to see the recommended programs specific to the following aviation sectors: Corporate & Business, Military & Government, Airlines & Training Centers, Flight Schools, and Owners & Operators. Need Help? >>> Short Video on How to Use this Page. Base upset training programs are designed to ensure every participant develops lifesaving skills that are transferable to their specific aircraft. The training programs aim to arm pilots of every skill level to effectively and efficiently deal with any recoverable in-flight upset. APS also offers you the ability to customize your overall training program through the use of enhancement in the areas you feel to be appropriate to your experience level, the type of airplane you fly and, in some cases, specialized missions. All of the base programs include various forms of intensified training, involving different training mediums and areas of flight operation. *Please call APS for program pricing outside of the U.S. Ideal for VFR pilots seeking comprehensive upset and stall/spin upset awareness, prevention and recovery. Structured for instrument-rated pilots to embed long-lasting knowledge and skills to defeat all-weather airplane upsets. Designed for multi-engine, high performance, career jet pilots to transport category-level stall and airplane upset skills. Powerful upset training refresher course for APS graduates to revitalize critical loss of control in-light UPRT skillsets. Addresses the loss of control in-flight needs of the professional transport category pilot to reduce the risk of stall/upset. APS offers two flavors of Airline Type-specific Upset Training Solutions; 1) Airline-direct, and 2) Train-the-Trainer. 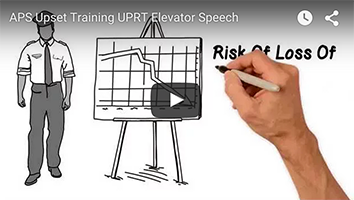 For pilots who want to add additional skills or concentrate on a specific area of emphasis in addition to their base or recurrent training program, APS offers a variety of UPRT enhancements. Taking half the day to complete following a base program, enhancements allow both initial and recurrent UPRT programs to be tailored to the pilot’s individual preferences. This building block approach is what makes the overall APS UPRT system unique and customizable to every pilot’s individual needs. Note: Some base programs already include certain enhancements as indicated at the end of the expanded explanation of the base programs above. Augment core UPRT knowledge and skills with an advanced spin awareness, prevention, and recovery session. Augment core UPRT knowledge and skills with an advanced multi-engine jet simulator session (for crew members or single pilots). Augment core UPRT knowledge and skills with a dedicated instrument-only upset awareness, prevention and recovery session.